The past few weeks we’ve laid out in detail how prices have increased and some reasons that would explain why. This week we thought we’d illustrate how the distressed market is faring versus the traditional or normal resale’s and look at how that impacts prices. As you can see from the chart, distressed sales are down about 4% in 2011 versus 2010. 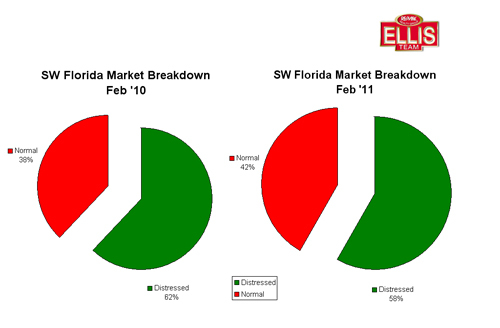 We all know distressed sales have weighed down the SW Florida real estate market for several years. Prices didn’t just fall in half, they fell in some cases to about 25% of what they were back in 2005 or early 2006. We’ve often said sale prices have fallen artificially too low and the only thing holding them that low was a flood of continuing foreclosures entering the market to keep the prices down. For the most part, investors and 1st time buyers bought every foreclosure they could and prices stayed low because there were new foreclosures coming on to satisfy buyers appetite. The foreclosure machine hit a snag in late 2010 due to legal concerns in Florida and 10 other states; however we expect that foreclosures will return in the 2nd qtr of 2011. The question is how many more are left, and how long will it take the banks to work through them. I guess the other question is how long will the economy be stagnant further forcing teetering homeowners over the brink? Assuming we’re in the 7th inning of the foreclosure crisis and that any wave of future foreclosures won’t be as robust as past waves, prices should continue to rise. Official numbers for March won’t be released for about 3 weeks, but preliminarily we’re seeing median prices rising about 3.45% over last year and mean average prices rising about 16%. Stats were pulled as of March 29, and it does take several days for all sales to be entered into MLS, so these are very raw and preliminary numbers, but they do coincide with what we’ve been seeing and predicting the last several months. As prices rise, more and more sellers will qualify to sell without being a short sale or foreclosure, which will also change the charts. Nobody should expect an overnight turn around as our market is still healing, and even though we’re in the latter stages of the correction, healing can be painful. Sellers expecting a return to 2005 prices might be waiting years or a decade or more. We’ll also be anticipating Congress submitting and passing a budget. Many do not realize that last year’s Congress didn’t do that, so we haven’t had a budget in 2 years. They’ve kicked the can down the road and left it for others to do. Because Congress didn’t do their job last year, it’s making it tougher this year, and everyone knows we need steep budget cuts. Inflation will rise as we cannot continue deficit spending. This throws the capital markets off and interest rates could rise, which could also affect real estate prices as increased rates dig into buying power for buyers. When rates go higher, buyers have to offer less for homes in many cases to afford the property. Increased interest rates are like a hidden tax on real estate, so we’d hope for our country to get it’s spending in order for a lot of reasons. Stay tuned and we’ll watch together how these forces play out and affect our market. Nothing is as simple as one variable dictating prices. We have several variables at work, and time will tell. Posted in Southwest Florida Real Estate, SW Florida Bank Foreclosures.Tagged Cape Coral real estate, Florida foreclosures.